Old Fort Niagara depends upon generous donors to help us fulfill our mission to preserve this unique, historic site, educate the public about its rich history, and collect objects and documentary materials related to the site and the Niagara region. General contributions are always welcome to defray the general operating expenses. Old Fort Niagara receives no general operating support from the New York State Office of Parks, Recreation, and Historic Preservation and depends upon admission fees, museum shop sales, membership fees, and donations from its supporters to carry out its programs of preservation and education. We will gladly send you a receipt for your very appreciated donation. 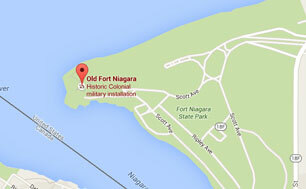 Old Fort Niagara is a not-for-profit organization under section 501(c)3 of the Internal Revenue Code. Gifts to the Old Fort Niagara Association are tax-deductible to the full extent of the law. The Association is a private not-for-profit 501(c)3 organization that operates Old Fort Niagara. A copy of Old Fort Niagara's latest financial report may be obtained from the Association or from the New York State Office of the Attorney General, Charities Bureau, 120 Broadway, New York, NY 10271.